If you are looking for a bright colourful and fun plant, then is one to consider. The flowers look great on the plant and can also be cut and used as dried arrangements. As the shell dries it forma a lacy lattice like skeleton around the small berries. 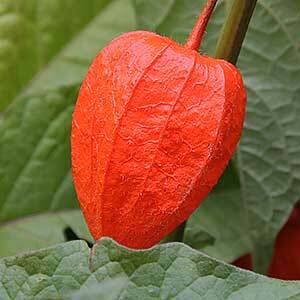 This is a perennial plant and it is grown for the large orange papery ball that covers the fruit. You need a good quality potting soil, or a position in the garden where the soil is free draining. Best grown in a position of part shade or afternoon shade this is a summer flowering plant. Be careful not to leave the old flowers on the plant as it can self seed fairly easily in the right conditions. Position – Part sun to a little dappled shade. Flowers – The flowers are actually white, the orange to red papery covering that hides the berries or fruit are the main attraction.